These last-minute Halloween decorations and projects will fill your home with color and atmosphere. Creepy, colorful, or comic, the decorating and party ideas are quick and easy to create. Create a spooky cast of characters using spools of thread for the mini-monster's bodies. Embellish with googly eyes, ribbon and string. We used felt cutouts for the eyes and mouths for the creatures. As party favors stick a lollipop in the hole on top. For a fun kids craft for the party, have them decorate their own. Nothing can disguise the appeal of this black-and-white Halloween wreath. The wreath displays all the mystery and excitement of a masquerade ball. To make the wreath, remove the elastic bands from simple black and white half masks. Using a plastic foam wreath form as a base, arrange the masks around the form, alternating colors and overlapping masks. Adhere the masks using straight pins or hot glue. 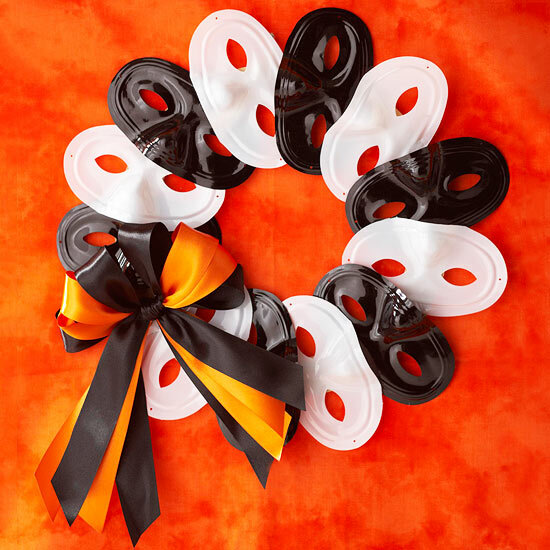 For a colorful contrast, tie a black-and-orange ribbon bow, and glue or pin to the wreath. These no-fuss pumpkin face decorations require no messy pumpkin carving and can be made in minutes. Cut the smiling pumpkin faces from black cardstock and tape the shapes to orange cardstock that has been cut to fit the lantern panels. 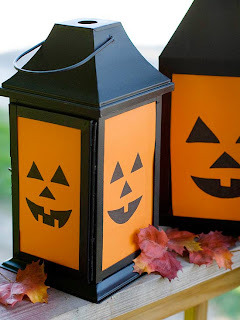 The finished product will brighten railings or steps during the day, but can also light up the night when you put battery-operated candles or flashlights inside the lanterns. Decorate hurricane lanterns to add an old-fashioned candle-lit glow to any Halloween party. Click on the link below for step-by-step instructions for this easy project. Measure the height and diameter of the lantern; subtract 1/8 inch from the height. Use these measurements to cut a piece of patterned paper and black paper. Spray the back of the patterned paper with adhesive; press onto the black paper. Use a crafts knife to cut a diamond-shape opening in the papers. Type the word you want on a computer, sizing it to fit inside the diamond opening; print onto vellum. With the word centered, cut the vellum slightly larger than the opening; glue to the black side of the layered papers. Cut 1/2-inch-wide strips of black paper to frame the opening. Trim one edge with pinking shears. Glue the strips along the front edges of the opening with the pinked edges toward the printed word. Spray the black side of the layered papers with adhesive; mount to the outside of the lantern with the bottom edges even. The paper should be slightly shorter than the lantern to avoid being a fire hazard.Spray the back of a coordinating patterned paper with adhesive; mount on black poster board for the brim. Measure the distance across the lantern bottom. Cut a circle from the layered brim papers 3 inches larger than the measurement. Glue the bottom of the lantern centered on the brim. Cut a 1-inch-wide strip of coordinating paper to fit around the lantern base. Pink the top edge. Spray the back side with adhesive. Adhere to the lantern bottom with the bottom edge touching the brim. 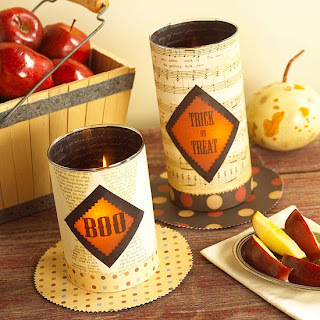 Insert a candle or as a party favor fill with candy! Welcome guests with the glint of candlelight and a spark of intrigue. 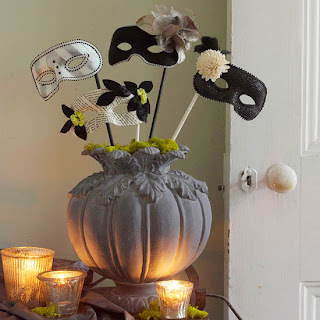 A stone-look urn resembling a pumpkin makes a lovely anchor for a bouquet of decorative half masks in black, white, and silver. Tuck floral foam into the urn, and press the dowel attached to the mask into the foam. Cover the opening of the urn with green moss. Place the urn on an entry table. Arrange distressed-glass votives on shiny silver fabric draped over the table edge. Accent the vignette with a bit more moss. 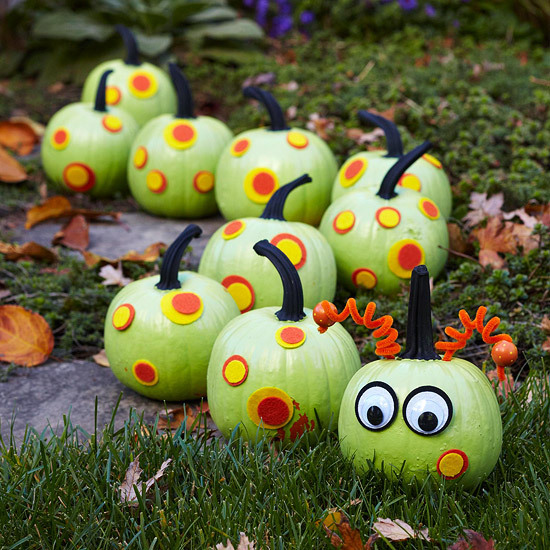 This easy-to-make pumpkin decoration requires no carving at all -- simply paint 10 pumpkins and the stems (we used light green and black paint, but you can choose whatever colors you like), arrange to form a caterpillar, and cover with adhesive-felt dots. Finish the creepy creature with a pair of large googly eyes. 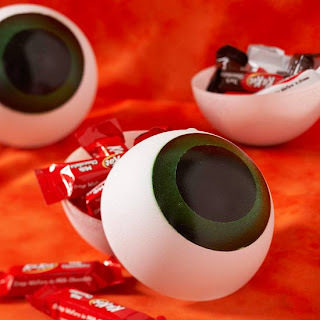 These pull-apart plastic ornaments transform into larger-than-life eyeball candy holders. Use a circle cutter to make two round stencils, then decorate. Enclose treats inside the spooky eyeballs for added fear factor. 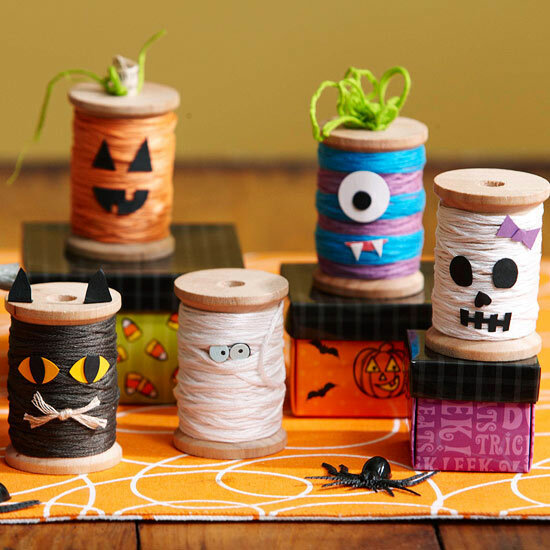 Line up paper pumpkins to harvest loads of cheerful creativity. The accordion-fold shapes can spell out whatever Halloween greeting suits your style and space. Keep it short and simple with a single word (we started with "fun"), or spell out a phrase (for example, "Happy Halloween!" or "Party Like a Pumpkin") to welcome friends to your Halloween haven. To make the garland, draw and cut out stemmed pumpkins from orange cardstock. Make one for each letter of your greeting; you can make extras to leave blank, too. 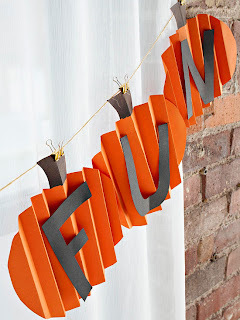 Cut letters from black cardstock to fit on the pumpkins. Accordion-fold the pumpkins with approximately 1 inch between each fold. Use black or brown marker to fill in the stem area. Use double-stick tape to attach a letter to each folded pumpkin, being careful not to flatten the folds. String a length of twine along a wall or above a doorway. Attach each pumpkin to the twine with a binder clip, or tape the stems to the twine. 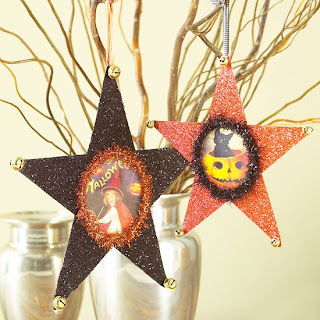 Create these easy, vintage-looking Halloween ornaments from everyday crafts supplies.